The hybrid technique is using the pick and fingers. This is used mainly by country musicians but many Jazz musicians use it now as it's pretty handy. The pick is held in between the index finger and the thumb, the other three fingers are then free to play each of the treble strings respectively. One of the most demanding aspects of this technique is getting the 3rd and 4th fingers of the rigth hand to operate independently. You'll find this fairly difficult with the left hand when you start to play demanding chords, this is because there are small muscles in the fingers that get very little exercise away from playing a musical instrument. 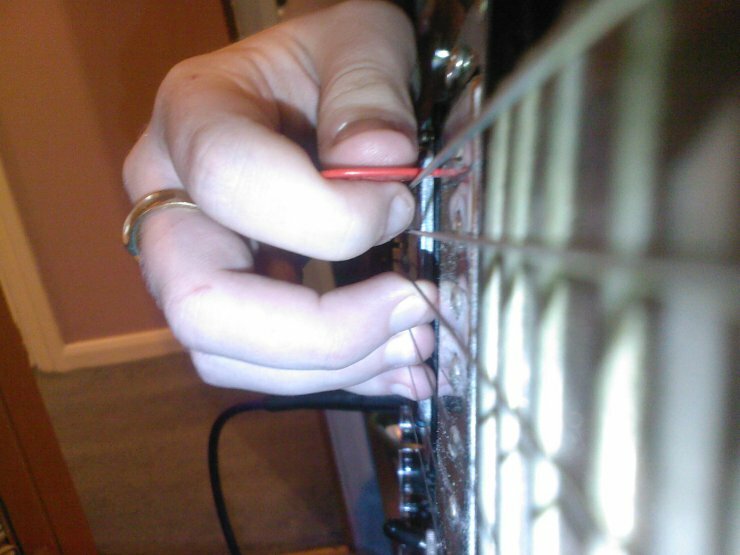 The pick is almost always downstrokes whilst the fingers play what ever it is you're playing. This approach to picking shouldn't be your first, it's fairly difficult and is best approached once you've become adept at playing with the fingers and the pick independently. Seperate picking to help you get used to using your little finger. The next thing you could do is look at my Bossa Nova lessons and use those chords with this technique. could barley do it. it looks insane cool. I lose my picks all the time too. So I went on ebay and bought a bag full of jazz III picks. They're smaller than normal picks but are easier to control. Used in a number of genres including metal. Try and think; there's no such thing as hard, just a worthy challenge. Should make this lesson easier. this is actually working really well. im working on a opening to a song where i slide the pick up the e string and it the bottim three strings with a d chord with my middle finger. lol i use jazz III's to, cause they have a pointer tip for shredding, and i saw alexi laiho used them and im a fan of his so i thought if he used them i should. i ended up liking them though. also on the second tab, there is no thing to show wich fingers to use.. can u use which ever are the most comfortable? It's the same as the first, the little finger always plays the first(high E) string, ring always plays the B string, then (arguably)middle plays the G and D string but the pick (Thumb and first finger) always play the A and low E string. Though if you're playing it in a rolling motion everything's often moved up. So looking at the first example, but the middle, ring and little fingers are instead playing on the D, G, and B - that's possible. I recommend learning "Diablo - Into Town" to help get your fingers used to finger picking. "r = fing (3rd) finger"
"You'll find with the left hand when you start to play demanding chords." They're sorted now though. Thanks. I started doing this exercise today and recomened it to everyone. I'm doing a cover of turn turn turn by the byrds on another forum and Roger Mcguinn uses this through the whole song. Glad you like it LP! I use this method as a last resort. You missunderstand me jazzy. What i mean is if its too difficult to pick the notes then I use the hybrid technique. Thats all. Now this is all i do anymore. The hybrid picking style. Hybrid picking with jazz III/s is an amzing combonation and for any nonbelievers go to youtube and watch dANNY gattons redneck jazz explosion.